Before I even get into this, first I have to establish something. I am not a watch expert. I dont know much of anything about movements, mechanics, jewels, etc etc, other than maybe a smidge more than the complete layman. All I do know is this... I like automatic watches. I've had a fascination for them for over 15 years now, and it's a pure and basic like: I like the fact that interaction with the human body (in this case, simple movement) can not only power, but maintain an important device like a time keeper. This watch review won't focus too much on mechanics, other than what I have learned in the research I've done into automatic watches over the years. It will focus on aesthetics, actual accuracy (as I measured it), and features that I can see without opening the case back. And it will focus on why I like automatic watches. Through the years, I've owned a half dozen automatic watches of a variety of types. I haven't worn a digital watch for about 12 years now, and with the exception of one of the watches below, I haven't worn a quartz watch for over 10 years. I like being part of the process... for the exact same reason, I like using a manual espresso machine like the Elektra Micro Casa a Leva or a La Pavoni Professional. My first automatic watch was a Seiko 5 watch, which is their most common line of automatics, but for some reason, fairly rare over in North America. It was cheap (about $35 when I bought it), thin, but it looked good, and kept reasonable time, usually within 10 to 12 seconds a day. Every week or so, I'd adjust it by about a minute. My first "serious" automatic watch was a vintage Seiko chronograph that, sadly, didn't completely work... portions of the choronograph features were damaged. But I got it at a yard sale dirt cheap, and who knows - maybe one day I'll get it fixed. My first "expensive" watch is a very rare and limited edition Seiko Kinetic Auto Relay watch. This isn't an automatic in the traditional sense. As far as I know, there is a quartz movement in them to keep accurate time, but there is no battery. The Seiko Kinetic movement goes beyond automatics because it constantly stores energy in a small capacitor, which can then power the watch for up to 40 days or longer. But mine is the Kinetic Auto Relay movement - it goes even beyond Kinetic... the watch keeps good time, is "charged" by the movement of your hand, but if you don't wear it for 72 hours, it stops working. Anytime after that, if you put it on your wrist and move a bit, it will "wake up", the hands will start spinning, and the analog watch will reset itself to the accurate, current time (you have to manually change the date). It can do this for up to 4 years after you last wore it. Pretty damned cool. But the entire time I had a fascination with watches, I wanted the epitome of the top of the automatics. No, not a Rolex. I have never liked Rolexes - the gaudy golds and diamonds, the flash, the "buy it for the brand name" style. Early on, I really liked a Tag Heuer chronograph automatic I saw at Eatons (a Canadian institution now long gone). 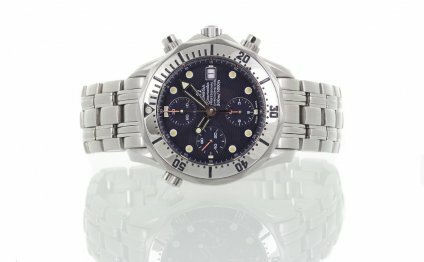 But since about 1994, I've wanted one watch - the Omega Seamaster Professional. I wavered between the Seamaster Professional Chronometer and the Chronograph for a long time. In fact, right up to the moment when I finally bought the watch, I was still leaning towards the much more expensive Chronograph... what's the difference? A Chronograph has stopwatch functions on top of time keeping (and sometimes an alarm function); a Chronometer only applies to Swiss made watches - it's a normal time keeping device, but tested to exacting specifications and accuracy by an independent body in Switzerland, and must pass some rigorous tests to get a "Chronometer" label and certificate. Each watch goes through the process - not just a sample, but every watch made by a company that wants to brand their watches "Chronometer certified". Mine went through this process, and I have the certificate to prove it. The day I finally decided to buy the watch (and thus putting myself into massive debt), I opted for the Chronometer version and passed on the Chronograph. Seeing the Chronograph in person gave me sticker and size shock - the prices was just too much, and the watch is freakin' huge - 16.3mm thick (over half an inch), and 208 grams. Hell, my Sony Ericsson P800 smartphone / pda weighs 150 grams. I like heavy, big watches, but that was too big. So I made the decision then and there to go for the Omega Seamaster Professional Chronometer, the large (40mm case size), weighing in at 150 grams, and 11mm thick. As soon as I put it on (believe it or not, for the first time ever), I knew I had to buy it. And I did.